As I briefly outlined in my introduction to UltraStar, there are a few different ways to play the game. This can depend on the version of UltraStar that you’re playing; I’ll go over the normal version first, but there is also another version called the ‘ChallengeMod.’ This isn’t quite as stable as the former, nor is it as smooth, but it still runs very well and has a lot of features that aren’t available on the normal version, which I will explain later in this article. On the current, ‘regular’ version of UltraStar Deluxe, you can select ‘Play’ on the initial menu; when it produces the players, you can rename them to you and your friends’ names, using the left and right keys to highlight a given player, backspace to remove the existing ‘Player 1’/’Player 2’ etc, and simply type in your real names instead. 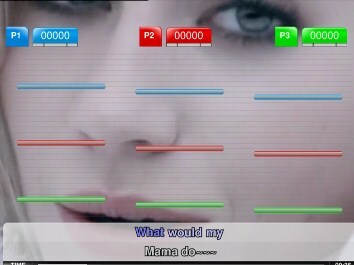 Once you’ve set up the game options, you can scroll through the songs and select one to sing. To search for a particular song, press ‘J’: a search box will appear, and you can type in the artist or song title (it will also bring up a particular folder that the songs are saved in, if you so wish). The number of songs on the screen will then be limited to those that meet your search critera. Select the song you want, and play it as per normal. Another keyboard shortcut that you may wish to use on the song selection screen is ‘R’: this will bring up a song at random. You can press this multiple times until something comes up that you want to sing. 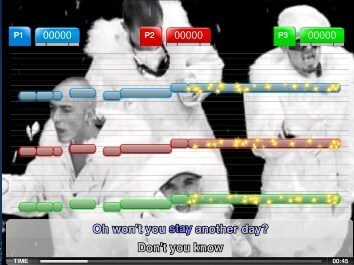 Regarding the general gameplay (the following applies to nearly all modes), beyond, of course, the idea to sing the lyrics at the point in which they’re highlighted, there are a number of quirks: Firstly, if you hadn’t noticed/didn’t know already, the notes take the form of a sort of piano scroll. It’s a bit hard to read it as sheet music, but you can judge, at the very least, whether the note should be higher or lower than the last one! The aim is to fill the colour of the notes by hitting them correctly. The more you do this, the higher your score. Not all of the lyrics, however, count towards your score. If they appear in Italics, no notes will appear on the screen – this is usually because they are not sung, but instead, rapped or simply spoken. These are called ‘free’ notes, and you’re welcome to talk/rap along if you wish, though it’s not necessary. There are also ‘golden’ notes, which are distinguishable (see the screenshot above for ‘Easy’ mode) by their shining appearance. Hitting these notes will be worth double the usual amount of points. In my personal experience, unless you and your friends are dying to do a particular song and therefore have one in mind, the process of choosing a song can be faffy (“Let’s do that one!”/”I don’t really know that one…”/”OK, how about this one?”/”Mmmm…”/”What do you want to sing?”/”What’ve you got?”/”A lot of songs, what do you like?”/”Have you got anything by Anonymous Socks?”/”No, how about The Beatles?”/”No, I don’t really like The Beatles…”/*Drops microphone* “Screw you guys, I’m going home”). It is much more fun, in my opinion at least, to play ‘Party Mode.’ This mode takes place over several rounds, with different modes of play. Players form up to 3 teams (this depends on how many microphones you have set up: 3 microphones=3 teams), and each team can have a number of players. For each round, the game ‘calls up’ certain players to sing (for this reason, it’s advisable to actually name each of the players here, so you don’t lose track of who’s who), one from each team grabs a mic, and UltraStar will choose a song (either from the entire pool of songs, a playlist, or a chosen folder in the song directory) at random. This narrows down the faff considerably – if one of the players really protests, then each team is allowed 5 ‘passes’ (or ‘jokers’) that will force the game to pick a new song; however, only 5 passes are available across all of the rounds, so they need to be used sparingly! At any rate, trying to sing a song you don’t know is just… well, hilarious. Party mode, then, wipes away your inhibitions and gets people going! Before going into more detail with Party Mode, it is worth mentioning ‘playlists’ at this stage. Whilst it can be amusing to try and sing a song you don’t know, it is more preferable to try one you can at least recall the chorus of. It may be a good idea to tailor the pool of songs used to that particular group of people. Playlists can be created by going to the normal song selection screen, finding the songs you want, pressing ‘P’ on each one, and adding it to a given playlist. It is easier, however, to download a program called UltraStar Manager. This is a great tool for many reasons that I daresay I will come back to in later entries. Using this software, you can drag and drop multiple songs at a time into a playlist. UltraStar Deluxe will recognise it when you next load the program. Failing this method, you can organise your song directory into folders, and you can choose one folder to use in the party mode. In each of the rounds in Party Mode, (2-7), there is the added element of the differing styles of play. The game will assign these modes to each round at random. Hold the line: There is a bar onscreen with a mark halfway across it. You basically need to keep your singing standard above this mark – if you falter, and it drops behind, then you automatically lose. The team who manages to keep their line above the mark will win. The song will end when there is only one player left standing. For each win, a given team is assigned 1 point. The team with the most points at the end of all of the rounds wins the game. If the types of gameplay described above float your boat, then the regular version of UltraStar will be just fine. What I particularly like about the newer versions of the normal UltraStar game is the fact that you can set visualizations to play when there is no video available – it’s also faster and more stable. The ChallengeMod version, however, is certainly improving with every release. I’m hoping that, at some stage, the two versions will be combined, but it may be a while before that happens. At any rate, I have both versions on my computer: the normal version for Party Mode or normal play, and the ChallengeMod for medley mode and duet mode. Medley Mode, available in the ChallengeMod version, is a very interesting addition to UltraStar. On the normal song selection screen, press shift + D. The game will then pick 5 songs at random, and play, in a row, the choruses from those 5 particular songs. The players build up a score across the medley, and the winner is the one with the most points at the end. For each song, the game eases you in, by initially playing the lyrics in italics (no points are available) so that the players can familiarise themselves with the song. It counts down to when the chorus begins, and then the players can start to sing if they haven’t already. It’s definitely a fun one – in this case, if someone doesn’t know the song, it doesn’t matter too much! I hope this makes sense. At some point, maybe this won’t be necessary, it’s just that USDB automatically removes these when a .txt is uploaded. When this is done, and you’ve loaded up UltraStar ChallengeMod, you can edit these songs in the usual way. Whatever you set the #GAP to indicates when the first player will start, usually Player 1. You can press shift + tab to switch to player 2 and ensure that their part fits, too – though the #GAP will still refer to Player 1. Because of the nature of duet songs, I’ve got two copies of ChallengeMod on my computer (as well as 1 copy of normal UltraStar) – one that links to the normal song directory (for Medley Mode), and one that links purely to a folder of duet songs. That way, if someone fancies doing a duet, I can just boot up that version. Duet songs won’t appear in Party mode, anyway, but it makes things a bit more organised. If you’ve already got some .txt files that you would like to turn into duets, this is easily done. Open the .txt file for the song, and for each of player 1’s lines, add P1 above it. For each of player 2’s lines, add P2. If you come across a line that both parts sing, add P3 in front of it. This entry was posted on December 5, 2010 at 7:24 pm and is filed under UltraStar. You can follow any responses to this entry through the RSS 2.0 feed. You can leave a response, or trackback from your own site. Hi, I’ve been waiting for ever to sing duets on ultrastar and now I see that it was already possible. One question, the “ChallengeMod” links to the official page, which only has the official version (albeit newer than mine). Has it recently been integrated? (tonight I’ll try it anyway). Thanks for all your infos! Let me know if you still have problems. It’s not yet integrated into the main version unfortunately.